Short-listed for the International Rubery Book Award, 2018. A small community, cut off from Cornwall by thirty miles of sea. At the whim of Atlantic storms. A shifting kaleidoscope of colour and light … Cari returns as a young teacher to the islands that captured her imagination in childhood. Now they take her way beyond known waters. She becomes involved with two people who have their own reasons for returning – Anna, a painter in her fifties who has cut herself off from her mainland past, and Hugh, drawn to the islands by a taste for self-reliance but now adrift. When a young girl disappears while on a school trip to the mainland all three are drawn into the mystery, and the unanswered questions of their own pasts become more urgent to resolve. It captures the wildness of place and character vividly. A moving, wonderful read. Molteno’s sensitive expression of her characters’ inner lives is the real treat of this novel, as she eloquently sketches a tale of desire, loss and forgiveness against a backdrop of indifferent sea and sky. Confident evocation of the islands’ atmosphere, the mix of sensuous beauty and extreme parochialism … The passages describing her characters’ childhoods are wonderful. At its darkest hour her plot has a Peter Grimes tragic potential. An intense, deeply personal novel. Molteno shows great compassion for and understanding of her characters, allowing the reader to care for them as much as she does. A muted, reflective meditation on the need for resolution. Beautifully written, a joy to read … Very sensitively explores what it means to see another place as more attractive than the one you know, and traces issues of identity and commitment in novel ways. Richly rendered – writing with a proper tang…The scent of savoury new fiction wafting in from the distant Isles of Scilly. From the first line Marion Molteno’s voice, simultaneously cosy and wise, compels you to crawl into the tent of your duvet before listening intently to her bedtime story. … Sympathetic characters, complicated but victorious; beauty, but not without darkness … She has a keen and unflinching eye for the pain, joy and awkwardness that results when people are thrown together. 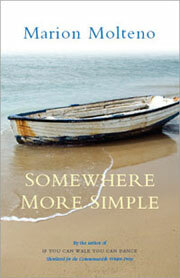 A wonderful book about the complexities of love and life in an island setting. Different story lines are intertwined into a penetrating picture that opens up at the end of the book. Eventually simple choices are made to follow the voices of heart and reason. A very thoughful work that gives life to the things that really move us. You have the most wonderful gift of being able to transport your reader deep into your books. I have never read a book before that when I closed my eyes I actually believed that I was there. It was magical. I trod every footprint that your characters took and really didn’t want the book to finish. A great book which transports you to the Scilly Isles so you can really feel the landscape and atmosphere of the islands. I got totally absorbed in the characters. You will not be able to put this down. Set on the beautiful and isolated Scilly Isles it opened up new worlds to me, both physical and emotional. The plot itself is a mystery but even more compelling are the human relationships of lovers and particularly siblings. The story is lightly and perceptively told, the pages whiz by. I recommend it for anyone touched by love or indeed who would like to be more touched by love. The interest never slackens, and I had to finish reading it in a day. Molteno does not strain for effect, but she tells the story with deep psychological insight and with poetic descriptions of the scenery – a very fine work! One of the best books I have read in a long time, and I read a lot. I felt completely like I knew the people in the book and the author describes places and characters very well so that you can actually imagine yourself there! A wonderful book! The feeling is one of calm peacefulness, of the importance of little things in life, of honesty, of waiting till our feelings sort themselves out, the importance of friends…of nature. What a dream book to read … flowing and totally captivating. I read it over the weekend, a real treat/tonic. I really loved it. The relationships rang true and the islands’ setting was evoked so vividly. I dropped everything else and just read to the end – now I’m reading a second time, taking it slowly this time!